The state hopes to make oil and gas leases more attractive by bundling nearby areas together — and offering seismic data. When the state of Alaska holds its annual Arctic oil and gas lease sales later this year, officials will offer something new to pique industry interest — three collections of contiguous lease tracts going by the acronym SALSA. The Special Alaska Lease Sale Areas are combined lease tracts north of Prudhoe Bay, south of Prudhoe Bay and along the north side of the Colville River Delta west of Prudhoe Bay. The tract collections range in size from 20,012 acres to 66,275 acres. Bundled with each set of connected lease tracts is a special sweetener to would-be explorers — a package of seismic data that the state has acquired through its oil-tax-credit program. The data that goes along with the lease tracts in the special program allows explorers to be “set up for success,” Chantal Walsh, director of the Alaska Division of Oil and Gas, said in a presentation to industry investors. “This compilation is meant to give you a jump start in understanding what data is available for the lease sale blocks. Sources of the data are also provided so you can expand your search to areas outside of the SALSA. This rich and insightful information will help you interpret and evaluate Alaska’s resources more quickly,” Walsh said in the online presentation. The tax-credit program, now being phased out by the state, granted tax reductions to producers that met certain requirements, including submission of seismic data to the state. That data was subject to a 10-year confidentiality period, which for some data batches has now expired or is on the verge of expiring. The state has received inquiries about the SALSA offerings from potential investors in Canada and the United Kingdom, said T.J. Presley, a policy and program specialist with the Division of Oil and Gas. Bids for the SALSA packages, as well as the bids for the state’s three annual Arctic oil and gas lease sales — for onshore areas of the central North Slope, for state territory in the Bering Sea and for territory in the Brooks Range foothills south of most existing oil infrastructure — are due on Nov. 13. Bids will be opened in Anchorage on Nov. 15. A lease sale for federal territory in the Arctic will also be held at about the same time, though the date has not yet been set. 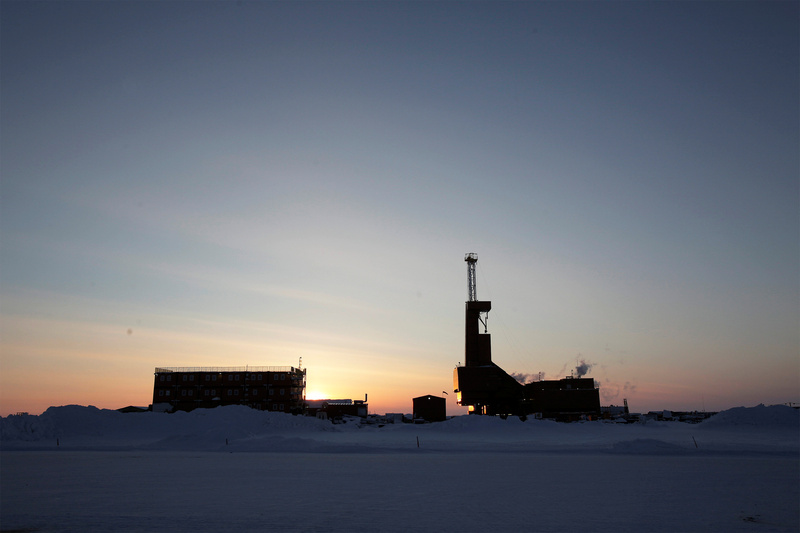 The U.S. Bureau of Land Management is preparing for its annual lease sale in the National Petroleum Reserve in Alaska on the western side of the North Slope. In past years, the state’s Arctic lease sales and the BLM’s NPR-A sale have been coordinated, held on the same day to encourage industry investment. In addition to its efforts to encourage more oil exploration, the state Division of Oil and Gas is seeking to boost geothermal energy development. The division has launched what will be a series of biannual geothermal leasing solicitations. If there is sufficient interest, the division plans to issue exploration licenses or hold competitive lease sales. Prospective areas for geothermal exploration, according to state data, include the Alaskan Peninsula and Aleutian Islands, which curve along the Bering Sea and are part of the volcanic and earthquake-prone Pacific “Ring of Fire,” and the Seward Peninsula near the Bering Strait, which is dotted with hot springs. The most recent Alaska geothermal-exploration program was at Mount Spurr, a volcano west of Anchorage. That program ended in 2016, the Division of Oil and Gas said.